“Matrix management” approach to project coordination. 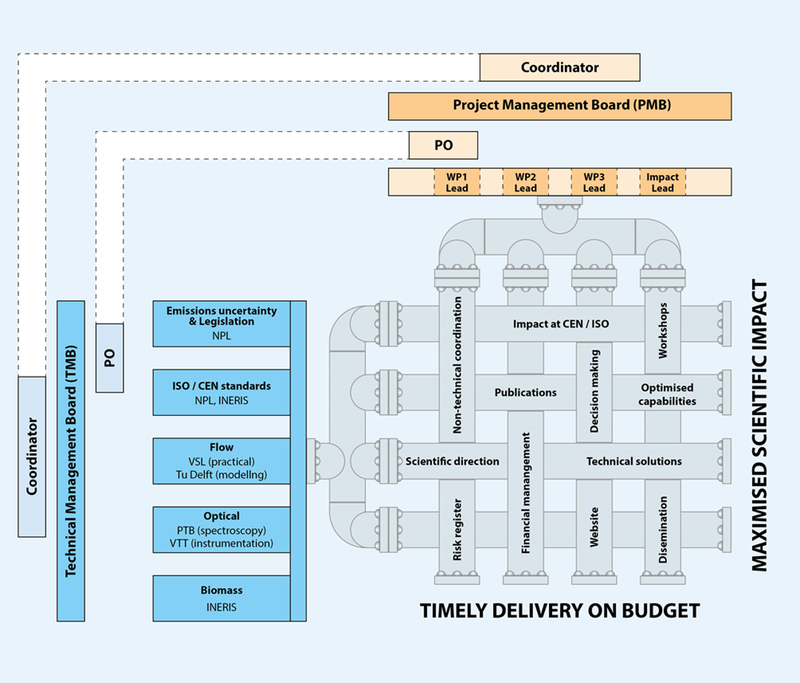 The Project Management Board (PMB) will oversee all non-technical aspects such as, Activities/Deliverables being on time, reviewing the risk register, etc., whilst the Technical Management Board (TMB) will review and address pan-project scientific issues removing scientific barriers to progress and facilitating greater scientific achievement overall (a fuller explanation of the above management structure to coordinate all partners is given in section C5 Management and Coordination). The project will be managed by the coordinator from NPL, who will be supported by the project management board (PMB) consisting of the coordinator (NPL, PMB chair), project officer (NPL), and leaders of each workpackage. The members of the project management board will guide the project, attend the project meetings and call additional meetings if needed to ensure the overall project’s success. A Technical Management Board (TMB) will also be created consisting of the coordinator (NPL, chair), PO (NPL), NPL (emissions uncertainty and legislation), NPL + INERIS (ISO/CEN standards), VSL + TU Delft (flow, practical and modelling, respectively), PTB + VTT (optical, spectroscopy and instrumentation, respectively), and INERIS (biomass). The kick-off meeting involving all partners will be held shortly after the start of the project, at NPL. There will be four further project meetings at months 9 (February 2018), 18 (November 2018), 27 (August 2019) and 36 (May 2020). The 18 month meeting will comprise of a major mid-term review of technical delivery against activities / deliverables The latter as the final project meeting will include a session of the TMB to assess the immediate impact of the project. At each meeting the sequence of meetings will be TMB, PMB, and then full consortium. This allows the TMB to feed into the PMB a top level scientific summary of the project and any associated non-technical issues that the PMB should discuss / make decisions. TMB and PMB outcomes can then subsequently be fed back and discussed with the full consortium. In advance of each meeting all partners will be invited to submit any items for discussion and inclusion on respective agendas. The location of the meetings will rotate among the partners. Progress reports will be submitted at months 9 (February 2018), 27 (August 2019) (+ 45 days), 18 (November 2018), 36 (May 2020) (+ 60 days). Periodic Reports (including financial reports and questionnaires) will be delivered at months 18 (November 2018) and 36 (May 2020) (+ 60 days) in accordance with Article 20 of the grant agreement. Final Reports will be delivered at month 36 (May 2020) (+ 60 days) in accordance with Article 20 of the grant agreement.